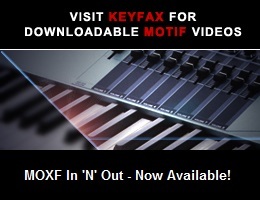 This will allow the Motif XF to send and receive MIDI data over the wireless network. Should I change anything re. MIDI channels? They are at default settings. You did not mention the network setting. Nor do you mention that you have your iPad set to your Motif XF. On the iPad’s Main screen go to SETTINGS > WI-FI > find your Motif XF’s Host Name and select it. Then launch the App. Yes Bad Mister...the iPad is connected to Motif XF. The XF is on ad-hoc mode for WiFi. You have all the correct settings so your issue must lie elsewhere. If we were to start troubleshooting your issue we would start with your Motif XF Firmware version and go from there. Am I doing right when I setup Motif XF WiFi for ad-hoc mode? I don’t think that it has to be on Infrastructure Mode. THANKS A BUNCH!!! IT WORKS NOW!! Everything works as documented now! This is sooo cool and Thanks many thanks to you and the Engineers who implemented this interface! Would you please direct me to the location? Under Interface, set the Device to wireless. Move the cursor to Wireless Setting and press [ENTER]. This brings up the Wireless Network Setting page. Set the Configuration Mode to ad hoc. Yes, & thanks for those instructions again , I was Not noticing that the Wireless Setting was highlighted when I moved the cursor over it, several times...that fine white outline! Ok! Ad-hoc was already picked, I left Security Off, pressed Enter again, pressed Store, powered Off, powered Up again, several of my 4 apps still don’t connect/work, but the Cloud Audio Recorder now works fine. Not sure what I’m failing to do, or procedures I’ve missed. I’m finding the Motif XF on the iPad, under Settings, Wi-Fi, connects fine to the Motif network, it’s check marked when chosen, in conjunction to the house Wi-Fi which works fine as well if clicked. Any thoughts or helpful suggestions would be appreciated in final setup of the remaining apps. Any thoughts or helpful suggestions would be appreciated in final setup of iPad apps. Set MIDI In/Out parameter under [UTILITY] > [F5] (Control) > [SF2] (MIDI) to network. Press [STORE]. Set MIDI Type to wireless in the Utility window of your Yamaha iPad Application. On iPad, go to Settings, under Wi-Fi look for Motif XF network, click on it, wait for it to connect. The iCloud Audio Recorder XF app works great though. Very awesome YAMAHA!! Thank You. It was bad enough in the start, having to find an open wireless LAN network to access the web, now I just have to remember which network to choose, for which ever uses I’m proceeding with, home Wi-Fi or Motif XF network.